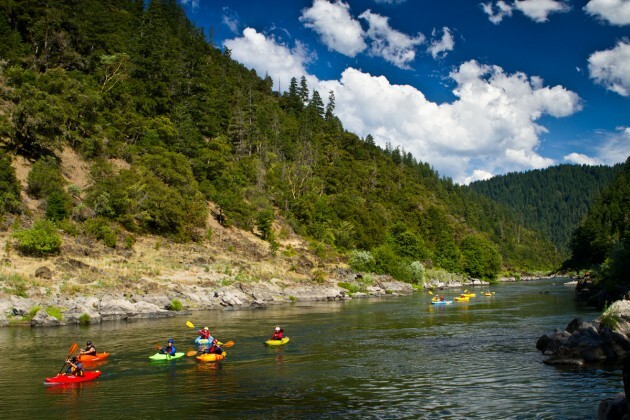 The Rogue River offers the perfect setting for teaching white water kayaking: Deep river gorges, spectacular scenery, abundant wildlife and classic Class 2-3 whitewater! The wild and scenic Rogue River Canyon is one of the best wilderness kayak trips in the country! 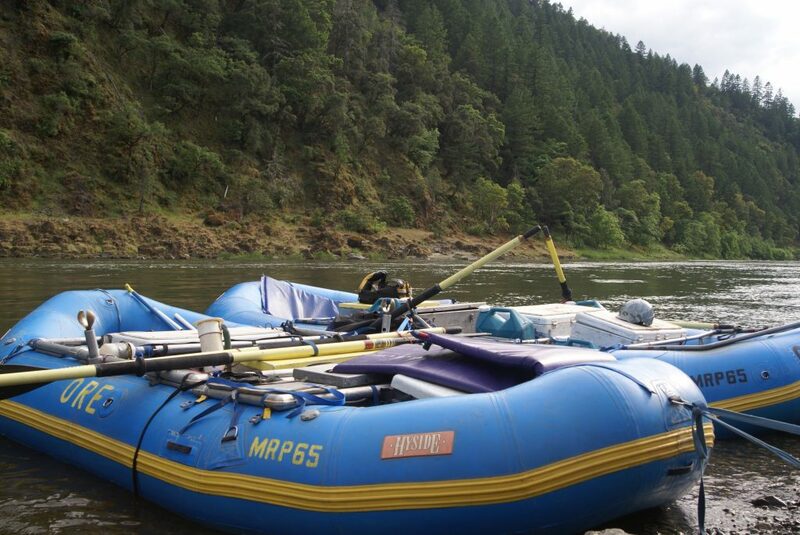 The most popular multi-day trip, the Rogue is a world class river journey. 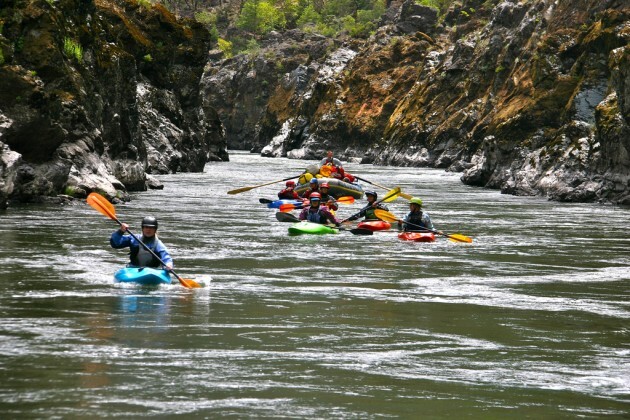 Oregon River Experiences is proud to offer this unique, 35 mile expedition in partnership with Sundance Kayak School, an outfitter based on the Rogue who has been leading kayak trips for over 40 years and is some of the best instructors around. It’s your choice, kayak for the pure enjoyment of running the river, or go for a structured progression to advance your skills. Sundance's instructors will be there for your safety and guidance at each of the rapids along with individualized instruction throughout the trip. The intermediate kayak curriculum is based on the concepts of play and efficiency, and particular emphasis is placed on precision river-running, as well as creative and freestyle river-running techniques. Many of the concepts that you will work on involve foundations of playboating that can be applied to any type of boating, in any kayak. You will be exposed to features like large waves, strong eddies and powerful currents. There will be opportunities to learn good boat control in tight passages, around ledges, and how to make complex maneuvers in fast current. We’ll help you bombproof your roll and enhance your river reading, through skills like eddy hopping, bracing, ferrying, draw strokes, and surfing. Sundance can help you expand your kayaking mind. Take advantage of the rivers natural features, and harness the river’s power to work for you. The surface of the river will start to become a moving terrain full of features that you can use. Our programs are flexible and are designed to accommodate your individual paddler’s needs & goals. You will gain skills, learn technique, and become a safer, more confident boater. Prerequisites: Class III experience and a solid kayak roll. The course is designed for kayakers with intermediate skills. This is the perfect opportunity to receive individual instruction and paddle Class III rapids on the Rogue River in Oregon with our instructors by your side. Day 1: The first day you will hone your skills in preparation for the downstream river trip. 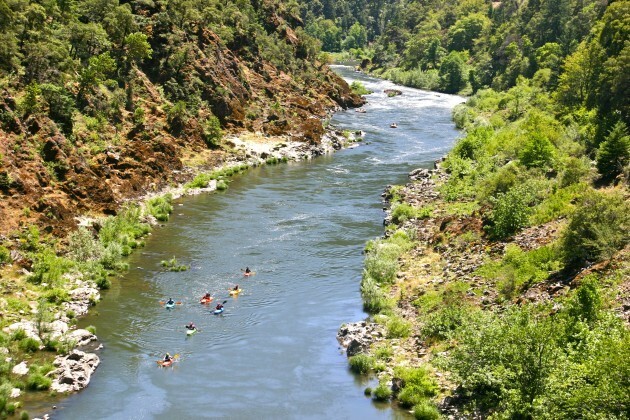 You’ll have the chance to practice your roll and your strokes while getting acclimated on the Rogue River. As the day progresses, we’ll start to head downstream and into the Rogue Wilderness. Days 2-4: The next three days will be spent on the Wild and Scenic section of the Rogue River from Grave Creek to Foster Bar. Each day, we cover between 6 and 14 miles, running some rapids in formation, and stopping to play in others. Time will be spent focusing on reinforcing your skills and honing your technique. You will start your day by waking up in one of the most beautiful places on earth. Coffee on the beach or morning hike while sun filters through the trees, marveling at the beauty as otters and ospreys start their day as well. Mid-day we will stop for lunch and you will have an opportunity to stretch, relax, or work on skills like the kayak roll. We usually arrive in camp by late afternoon and once we’ve made camp, your free to engage in a variety of leisure activities. Nap, fish, swim, read a book, practice skills with an instructor, go on a hike, or sit back and relax as dinner is cooked riverside. Horseshoes anyone? Take a moment to enjoy the sunset and Dutch oven dessert before settling in by the fire under a blanket of glittering stars. Last day: We typically arrive at Foster Bar, our take-out point, between 1:30 and 3:00 PM. Once we’ve unpacked, you’ll board a van for the ride back to Galice. The ride takes about two hours on scenic Bear Camp Road through the Siskiyou National Forest. We arrive back in Galice between 4:30 and 6:00 PM. The services of our professional guides and staff. Wold class personalized kayak instruction from Sundance Kayak School. Transportation to our launch point from Galice, and from our take-out back to Galice at trip’s end. All meals, from lunch on the first day through lunch on the last. Our menu is delicious, varied, and hearty. Meals are freshly prepared by our guides from the highest quality ingredients. Juice and water are available at each meal. Coffee, tea, and cocoa are available at dinner and breakfast, and complementary wine is served with some dinners. Special dietary needs may be accommodated with advance notice. We also provide cups, plates, and silverware. Durable, professional quality rafts and river running equipment, including U.S. Coast Guard Approved lifejackets. Waterproof river bags and boxes for your personal gear. Kayak rental available for an additional fee. We meet at 8:30 AM on the day your trip begins, at the Galice Resort Cafe. To get to Galice, take Interstate 5 to the Merlin exit (exit # 61), five miles north of Grants Pass, then follow the signs to Merlin. This will put you on the main road, which passes through Merlin and continues to Galice, about 15 miles west of I-5. The Galice Resort is on the right-hand side, between the road and the river. There’s no “Galice Resort” sign – look for the café. The address is 11744 Galice Rd, Merlin, OR 97532. Galice is roughly a 40 minute drive from Grants Pass. The closest commercial airport is Medford, Oregon. It is served by Alaska, United, Delta, and Allegiant airlines. Plan your flight to arrive the day before your river trip begins. Car rentals are available at Medford. Also, the Galice Resort offers shuttle service from the airport to Grants Pass or to the resort (which is our meeting place). Shuttles are $525 round trip, per van, so your ultimate cost depends on the number of people (1 to 14) who share the ride. For more information or reservations contact the Galice Resort at 541-476-3818 or visit www.galice.com. Details, tips, and a complete list of what to bring are found here. You will receive a copy of this information when you sign up for your trip. The river we now call the Rogue has been known by a variety of names over the years. Trappers called it Tutuni, with various spellings, meaning rogue or rascal Indians. For the same reason, French trappers called it La Riviere aux Coquins, the River of the Rogues, and Henry Eld of the Wilkes Expedition in 1841 wrote in his journal about the Rascally River. The river was also known for a short time as McLeod’s River, after an early explorer, and by the Territorial Legislature as Gold River. Tribes speaking two different languages occupied the Rogue River valley and surrounding area. Prior to the arrival of the Europeans. The Tutuni lived along the coast, at the mouth of the river and for a distance upstream. In 1854 the Tutuni population was estimated at 1,311 people; 383 remained in 1910. The Takelma tribe lived along middle sections of the Rogue, as well as along the Illinois River, a tributary of the Rogue. (Takelma, by the way, means “those who dwell along the river”.) In 1780 the tribe’s population was estimated at 500; only one person remained in 1910. The Tutuni lived in large permanent villages made possible by a plentiful, year-round supply of food. They relied heavily on food from the sea, including salmon, shellfish, seaweed, and occasional whale-meat. Deer and elk, as well as berries and seeds were also included in their diet. The Takelma, on the other hand, were semi-nomadic, and moved from place to place as food supplies became scarce. They relied on deer and other game, berries and root plants for their sustenance. The Takelma were more aggressive than the Tutuni. The Takelma raided their neighbors to the west for food, other supplies, and slaves. Slaves were, in turn, often traded to the Klamath Indians to the east. These raids aside, until about 1850 the Rogue River country was a relatively peaceful place. The Takelma’s reputation for aggression, combined with a report by explorer McCloud that described the area as “destitute of beaver” kept the encroaching tide of outsiders at bay. But two events changed this. One was the 1850 Land Act, which promised 320 acres to each Oregon settler over 18 years of age. (Eventually, 2.5 million acres were given away under the provision of this law.) The other event was the discovery of gold, first on Josephine Creek along the Illinois River in 1850, and then near Jacksonville in 1851. Soon, settlers and miners were flocking to the Rogue River country. By 1853 most of the rivers and creek beds of southwestern Oregon were being prospected for gold. Signs of this busy period in the Rogue’s history remain at numerous sites along the river today. Miners and settlers in large numbers cut trees, hunted wildlife, and took over lands that were the homes of the Tutuni and Takelma. Displaced natives resorted to harassing wagon trains and disrupting mining operations in defence. Skirmishes and counterattacks grew into a conflict that came to be known as the Rogue Indian War. This 8 month war began in October of 1855 with the Battle of Hungry Hill, near Grave Creek, and ended the following May with a battle south of Illahe at Big Bend. Most of the war was fought in the remote, winding canyons of the Rogue. The end result of the conflict, as with similar conflicts elsewhere, was that those Indians who survived were relocated — in this case, to the Grande Ronde and Siletz reservations. By 1857 no Indians remained in their former homeland. But although there had been a large influx of newcomers earlier in the decade, further settlement occurred slowly, due to the ruggedness of the river canyons. The ecosystem of the Klamath Mountains and the Rogue canyon is a complex mosaic of plant communities that provide homes for a wide variety of wildlife. Geologic complexity and a long history of relatively mild climate have created a haven for a diverse mix of plant and animal species, some of which represent prehistoric environments that have long since disappeared elsewhere. Among the tree species found along the river are California black oak, canyon live oak, Oregon white oak, bay, big leaf maple, madrone, Douglas fir, and red alder. A wide variety of flowering plants bloom in the spring, including azalea, the fragrant white blooms for which the rapid Blossom Bar is named. An abundance of birds and other wildlife make the Rogue canyon their home. Osprey, bald eagles, hawks, water ouzels, heron, and a variety of songbirds are seen. Raccoons, river otters, deer, mink, black bear, bobcat and other mammals are here, too. Steelhead, Chinook and Coho salmon either live in the river year-round or migrate up-river to spawn. (Sadly, in recent years their numbers have been decreasing, due to the combined effects of overfishing, damming the river’s upstream reaches, and increased situation due to logging, farming, and urbanization.) Also found in the Rogue are sturgeon, bluegill, smallmouth bass, catfish, sculpin, and shad. Trout are native to the larger tributaries, such as Big Windy, Kelsey, and Missouri Creeks. The Rogue River country, which is a part of the larger Klamath Mountain Province, is one of the most structurally complex regions in Oregon. This complexity is due to the region’s position at the edge of the continent, and the role that plate tectonics played in the evolution of the area. 150 million years ago (during the Jurassic period) rocks were being deposited along an ancestral North American coastline. Simultaneously, movement of the Earth’s crust caused the floor of the Pacific ocean to begin to move towards the mainland. The Pacific and North American plates collided. Volcanoes generated by the collision developed into an offshore island chain. As this collision continued, pieces of the sea floor were pushed up against the mainland. The Klamath Mountains are built both of fire and water. Today we see evidence of volcanism, and one can find ancient sea floor, which once was hidden under three miles of water, now perched two to three thousand feet above sea level. Oregon’s portion of the Klamath Mountains was originally situated 50 miles south of where they are now. About 100 million years ago they broke loose from the mainland along a fault which slowly moved them into their present position. Finally, beginning 50 million years ago, the area was uplifted and distorted, then eroded to create the rugged topography we see today. In the vicinity of Galice the Galice formation is exposed in the river bed and along the banks. Elsewhere the Galice formation is in excess of 15,000 feet thick, but here we see only a thin slice of that. Rocks of the Galice include mudstones and some black shales. In addition to the mudstones, the Galice bears a thick section of volcanic rocks, some of which, unlike the mudstone and shale, are relatively coarse-grained and very resistant to erosion. In places the Galice mudstones and shales have been altered by heat and pressure to form hard slate. As the river winds northward out of Galice we very quickly pass from the Galice Formation into the older rocks of the Rogue formation. These rocks originated as submarine lava and ash flows around a chain of volcanic islands. Most of these rocks have been altered by heat and pressure since their formation to create the hard, resistant rocks we see today. Rainie Falls exists because the extra-hard rock found there is resistant to the river’s erosion. Rainie is a good place to view banded metamorphic rock called gneiss, as well as veins of a pale, pea green mineral called epidote. Landslides are common in the Rogue River canyon. One slide, which occurred near Whiskey Creek in the late 1800’s, dammed the river for a time and backed water 15 miles upstream to Hellgate. Down river near Tyee Rapid the Rogue formation is replaced by the Dothan formation, which dominates the next 20 miles of river. This formation is composed mostly of sandstone, with some siltstone and mudstone also present. In places along the river these rocks have been warped into tightly bunched folds by the forces that created the Klamath Mountains. At Horseshoe Bend the river begins a dramatic detour around a hard, quartz-rich wall of rock that temporarily deflects the river from its course. The change from Dothan back to the Rogue Formation rocks occurs just below China Bar. Less than a mile downstream the river bends sharply to the left and follows an ancient fault line through Mule Creek Canyon. Here Dothan formation rocks comprise the left (east) wall and Rogue formation rocks the right. During the 1964 flood the river level was 80 feet higher here than it is at normal summer flows. At Blossom Bar, the river’s most legendary rapid, evidence of the power of flowing water is a dramatic sight. The boulders — which create the rapid’s channels, waves and obstacles — were carried down tiny Blossom Bar Creek, from a mile or more upstream, during a flood on that creek. Below Tate Creek the Rogue formation gives way to the Flournoy formation. These marine rocks are evenly bedded layers of sandstone and siltstone, as well as conglomerates, which create the unusual and striking formations seen near Flora Dell Creek. At 50 million years old this is the youngest geologic formation along the river. Guests sometimes ask whether it is appropriate to tip their guide. Tipping is optional, but if your guide did a great job then feel free to thank him or her with a gratuity. The amount is up to you, but tips between 8% and 20% of trip cost are customary. Gratuities are customarily presented to the Lead Guide, and will be shared equally among all guides on your trip. Guests on our Lodge and Camp/Lodge trips may wish to consider offering a tip to lodge staff as well, just as one might do at a Bed and Breakfast in town. Our most popular multi-day trip. A world class river journey! Excellent forest and canyon scenery. A great river for viewing wildlife. Very good for swimming: warmer water than most Oregon rivers. Near Crater Lake & Redwood National Parks as well as Ashland's Shakespeare Festival.